There are plenty of cheap VPNs but many sacrifice speed or skimp on security while others won't work with your favorite streaming services. These 5 budget VPN services punch well above their weight. There is no shortage of cheap Virtual Private Network (VPN) service providers, but does a low-cost service mean sacrificing some of the features any good VPN should include? Will the cheapest VPNs keep your online activity private? Will they work with streaming services like Netflix, Amazon Prime and BBC iPlayer? We take a look at 5 affordable VPN services that cut prices but not corners. 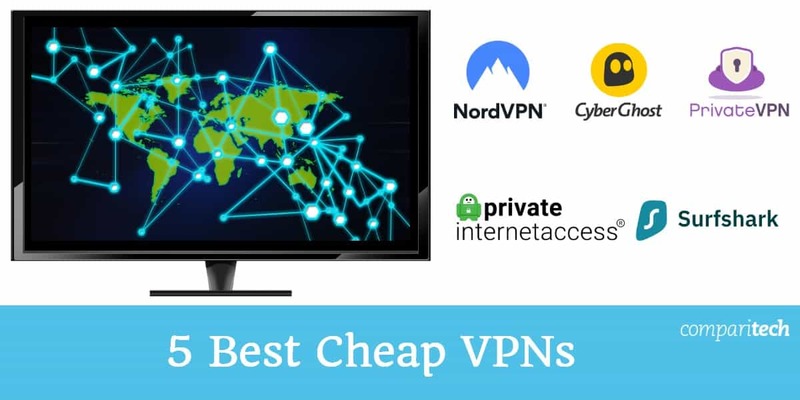 VPN services don’t usually cost an arm and a leg but we understand that there are many users out there on a tight budget looking for cheap, reliable options. Free VPN services don’t cut it because they’ll usually skimp on download speeds and encryption standards. Opting to use a VPN is an excellent choice in the first place, so in this article, we’ll take you through our list of the ones that are inexpensive, reliable, and deliver the most bang for your buck. CyberGhost – Our preferred option. Very fast, unblocks Netflix, great security, and no logs. NordVPN – A good budget choice which works well for streaming. Solid security and speeds. PrivateVPN – Simple interface, unblocks Netflix, fast speeds, and good security. Surfshark – Unblocks Netflix, no logs, and decent security. Unlimited simultaneous connections. Private Internet Access – Good security, no logs, and offers some more advanced options. CyberGhost is an excellent option for beginner users on a budget that want a plug-and-play option without many frills or customizable options. The company is headquartered in Romania – out of the reach of any mandatory data retention laws. The company abides by a strict no-logging policy. Torrenting is permitted on most servers except those located in the United States, Russia, China, and Singapore. CyberGhost operates thousands of servers in more than 60 countries. It’s the fastest VPN we’ve tested in 2019, and it also tops the list of the most secure VPNs in our annual VPN security assessment. CyberGhost makes it easy to unblock your favorite streaming sites like Netflix and BBC iPlayer by selecting them right from the app, rather than guessing at which server locations work. Apps are available for both Android and iOS as well as desktop support for Windows and MacOS. A maximum of seven devices can connect simultaneously. BEST CHEAP VPN:CyberGhost is our top choice. A good all-round VPN with great privacy, zero logs, fast speeds. Unblocks geo-restricted content like Netflix. Try it risk free with a 45-day money back guarantee. NordVPN is our top recommendation and a veteran in the VPN space. It has tons of customizable options and will appeal to both beginner and power users. NordVPN boasts a zero logs policy, so it doesn’t track anything you do online. Encryption standards are top-tier – NordVPN uses the 256-bit AES protocol encryption standard by default coupled with 2,048-bit SSL keys. DNS leak protection is enabled ensuring safety when connecting to public wi-fi. It operates 976 servers in 56 countries. The service works with a number of online streaming services such as Netflix, Hulu, and BBC iPlayer without any problems. Plans come with unlimited bandwidth and torrenting is permitted. Apps are available for Windows, MacOS, iOS, Linux, and Android. The service allows six devices to connect at one time. GOOD BUDGET VPN:NordVPN is a good low cost VPN. Great performer for streaming and torrenting. Strong privacy and security features and allows up to 6 devices to be used simultaneously from one account. Includes a 30-day money back guarantee. PrivateVPN is a relative newcomer in the industry and doesn’t offer the expansive server network that’s a hallmark of players like NordVPN. But the service is cheap, easy-to-use, and packs a punch when it comes to speed and stability. PrivateVPN says it stores zero logs of any kind about its users. The service offers DNS leak protection, an internet kill switch, and IPv6 protection as standard. Encryption standards are also tough. PrivateVPN uses 128-bit CPC encryption for TAP and 256-bit AES for TUN on the default OpenVPN protocol. 2,048-DHE keys provide perfect forward secrecy. PrivateVPN doesn’t have many servers, but it does unblock more international Netflix libraries than any other VPN we’ve tested. It also unblocks other geo-restricted sites like BBC iPlayer and Hulu. There are apps for Android and iOS as well as desktop apps for Windows, MacOS, and Linux. Torrenting is permitted, and one user can connect up to six devices at any time. GREAT SPEEDS:PrivateVPN is a good family choice. Download speeds were surprisingly good at this end of the market. Could do with having more servers. 30-day money back guarantee. Here’s our in-depth review of PrivateVPN. Surfshark is a newer VPN that’s great for unblocking Netflix and other streaming services without adding too much onto your monthly bill. It works in China and allows torrenting, too. Every connection is protected with strong encryption, and Surfshark doesn’t store any logs of user activity or other identifying information. 24/7 live chat support is ready to help. Best of all, Surfshark allows you to connect an unlimited number of devices, which makes it a great option for a family or group of housemates with a lot of phones and laptops. Apps are available for Windows, MacOS, iOS, and Android. UNLIMITED DEVICES:Connect multiple devices on the standard Surfshark plan and take advantage of the 30-day money-back guarantee. Read our full Surfshark review. Private Internet Access (PIA) isn’t flashy, but it’s powerful and does the job well. The company doesn’t store any logs and uses the best encryption standards available. PIA offers a pretty diverse range of server locations – there are 3,272 of them spread across 25 countries including many in the Western hemisphere. Torrenting is permitted on all servers. A user may connect up to five devices with a single account. PIA supports Android, iOS, Windows, MacOS, and Linux. Unfortunately, it doesn’t always work with Netflix. GOOD PERFORMER:Private Internet Access offers strong security, a low price, and great customer service. Speeds can be inconsistent. 7-day money back guarantee. Read more in our review of PIA. Will free VPNs do the job? Users short on cash might be tempted to go for a free VPN service. They’re present on the internet and don’t require you to fork over your credit card details – luring and enticing users who think they’re getting the real deal. We recommend you proceed with caution. Many such ‘free’ services have been caught indulging in fairly abhorrent practices such as forcefully injecting tracking cookies, mining your data, and selling it to third-party advertisers. It’s a handy reminder of the fact that when the product is free, usually you end up being the product. Other VPNs might be freemium which means that even if they don’t steal your data, they’ll definitely subject you to download caps, bandwidth throttling, and a small selection of servers (usually only one or two). They’re not bothered with robust encryption either, so there’s a continued risk of being exposed. After all, such companies are registered businesses too. They need to make money to pay for salaries, office space, and server maintenance. Our recommendation is to avoid these traps to stay safe. Cough up a few dollars each month – it’ll be worth it. No matter what you pay for when you sign up for a VPN, it’s essential to trust the company and rest assured that your private data will never be at stake. All the VPNs mentioned in this list have upheld this principle, but there are a few unscrupulous ones lurking around that don’t think it’s as important. We recommend that you leave them alone. Israel-based Hola, which once had a sturdy userbase of almost 50 million, duped its community and turned it into a massive botnet. This meant that some of your bandwidth was illegally bifurcated for things like distributed denial-of-service (DDoS) attacks and distribution of copyrighted content. We think it’s best if you avoid Hola. Hotspot Shield, a notable free VPN service provider, ran into trouble last month after a privacy advocacy group filed a complaint against it. The complaint maintained that Hotspot Shield inserted tracking cookies in user data and sold it to advertising companies. It didn’t stop at that either – another assertion was that it “redirects ecommerce traffic to partnering domains”. In layman’s terms that means forceful navigation towards affiliate sites. A decision on the matter is still pending, but the overall nature of the complaint does follow a certain trend. Our recommendation is to avoid Hotspot Shield for now and until they are exonerated. We don’t condone using VPNs to break laws by expecting that your identity will remain hidden. At the same time, we do think that VPN providers have a moral responsibility to be open and transparent to users. When that principle isn’t upheld, we feel it’s a major red flag. For the uninitiated, a Virtual Private Network (VPN) is a software that helps you stay safe and secure on the web. The service works by encrypting all the web traffic to and from your account and routing it via an intermediary server of your choice. This helps keep nosy surveillance agencies and hackers at a distance and also makes it seems like you’re accessing the internet from a different location. The latter feature makes it possible to unlock geo-restricted content on streaming services. That’s one of the reasons why foreign expats find a VPN to be an excellent choice for staying in touch with content from back home. 11 Will free VPNs do the job? 13 What exactly is a VPN? 7 Will free VPNs do the job? 9 What exactly is a VPN?